How can one best portray an accurate picture of the work of Lee Bae when the artist himself has been devoted to a modus operandi that defies the confines of definition and exactitude? When an artist persists in their exploration and negotiation of a specific aspect of visual expression or artistic production, they often come to be associated, even defined by that particularity: Beuys and felt, Warhol and the Campbell Soup Can, Pollock and the drip. 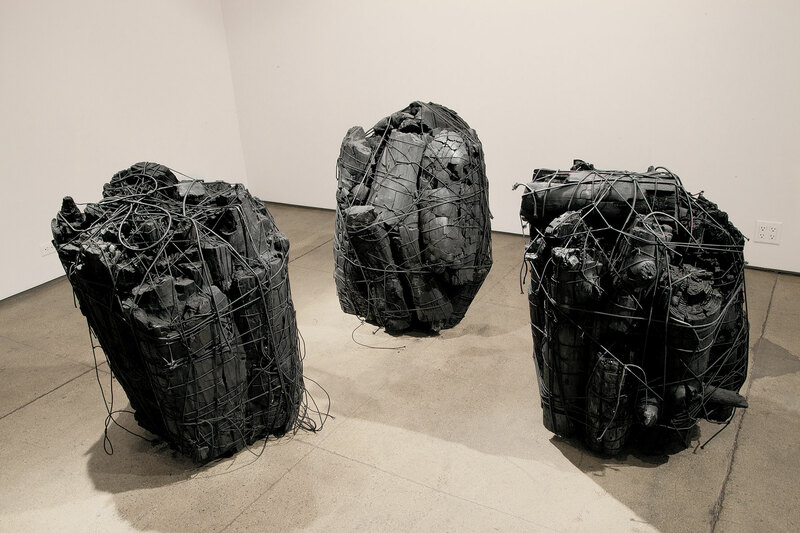 If we were to follow such a critical paradigm, we would mistakenly infer a linearity of interest, evidenced in Lee Bae’s recurring usage of charcoal and its derivatives as well as his ongoing employment of Black and White. 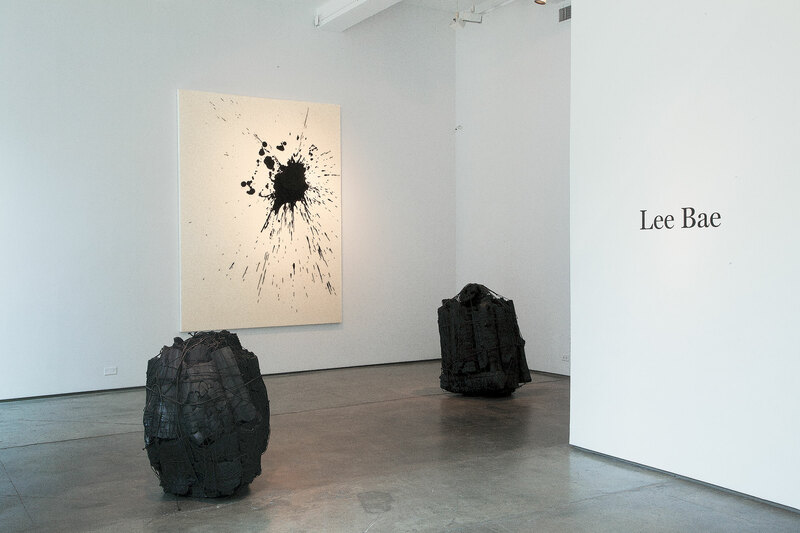 Lee Bae’s gestalt of ostensibly similar elements, however, is a unique landmark within contemporary artistic practices that encapsulates the very rare ability to bring together within an ever-growing body of work the modern/contemporary construct of Formalism as well as the cerebral and communicative inclination of Conceptualism. “… and so feeling became the substance of my life.”1 Thus proclaimed Malevich in describing the crux of what Suprematism was all about: to free art from the ballast of objectivity and to provide feeling with an external form. The year was 1915 when Malevich created his then much contested Black Quadrilateral on White painting. Formalism was born, and the Modernist quest for “Pure Art” along with it. A mere two years later, Duchamp’s Fountain sent ripples of astonishment across the arts world. Although no more than une pissotière en porcelaine, as Duchamp described it in a letter to his sister2, it changed our perception of art forever. The notion that art is the mark of a specialized manual “skill” that separates the artist from other human beings was made obsolete. It no longer mattered whether Duchamp had executed the fountain himself or not. What mattered though is that he chose it. “He took an ordinary article of life, placed it so that its useful significance disappeared under the new title and point of view – and created a new thought for that object.”3 Conceptual art was born. 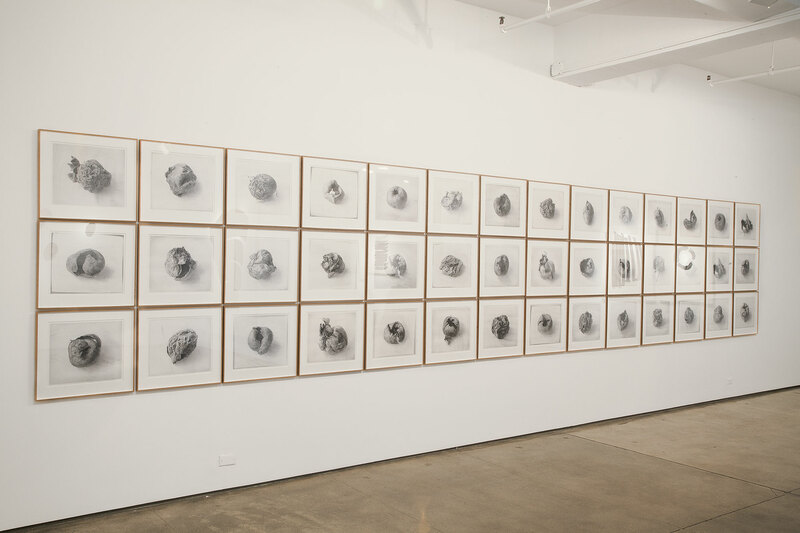 Whereas Formalism’s emphasis was on the aesthetic experience, Conceptualism favored communication over response. Both schools, however, have been in constant metamorphosis. Pollock’s Abstract Expressionism and Fontana’s Concetto Spaziale are but two examples of an art that champions the purity of form as an expression of feelings that are unbridled by narrative or figural representation. Fluxus and archiving are two of various manifestations of Conceptual Art. Over the many decades that have elapsed since Malevich’s squares and Duchamp’s readymades, very few artists have managed to bridge the conceptual and aesthetic space that exists in between the two. Lee Bae is one of those artists. His work testifies to an ability to navigate both realms with equal confidence. This stems from a profound command of gesture as well as an equal commitment to an honest expression of both, form and self. “There has to be an encounter between a medium and my sensitivity. I need to be able to give it a meaning. 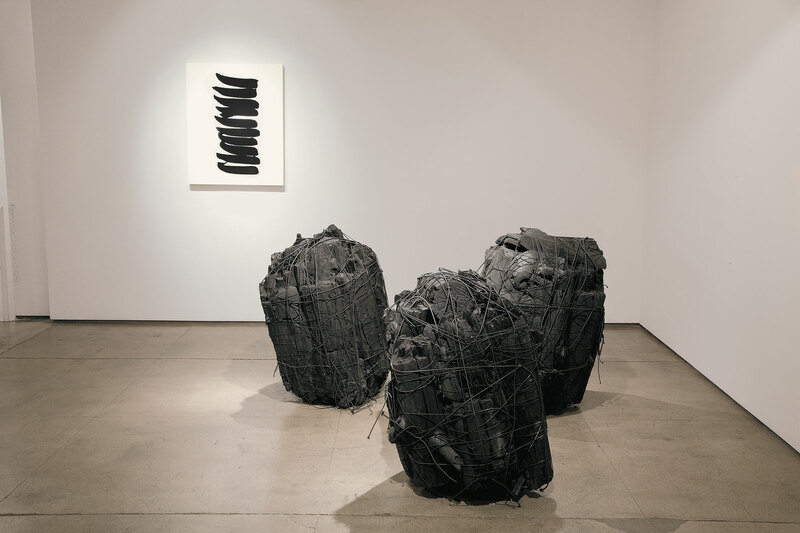 It is an alchemy, a balance between what is essentially external to me – namely the medium – and something internal – what I want to do with it with what I have in mind.”4 With these words Lee Bae reveals his concern for objectivity in transposing, but never transforming his medium, which for two decades has comprised of charcoal in various applications. 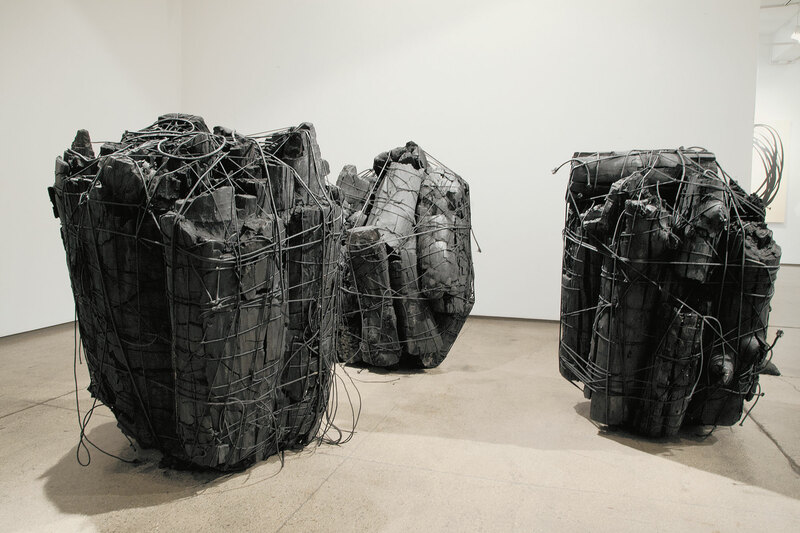 In his installations, or interventions as he prefers to call them, he introduces his sculptural charcoal pieces into the “cultural” space without the slightest artifice. 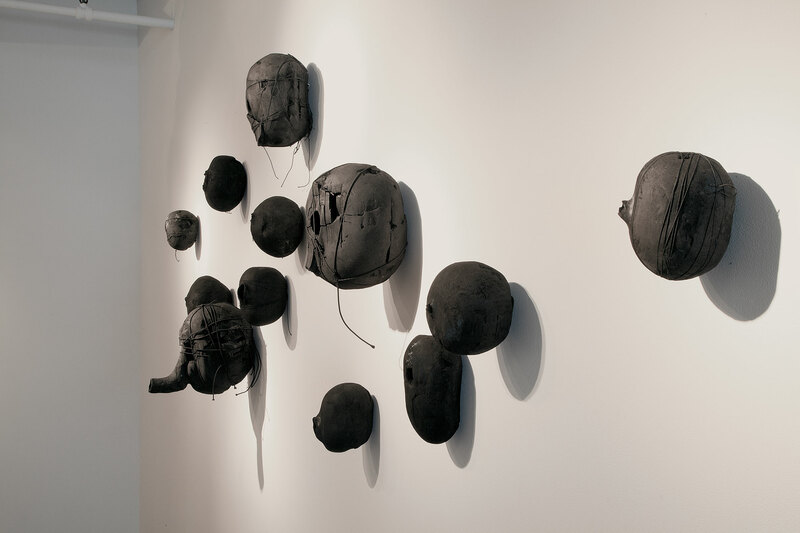 Sometimes they hang on walls and at others they are strewn on the floor, held together by black non-intrusive wires. His intention is never the installation itself, but the freeing of the medium from the closed and sometimes constraining frame of the canvas. 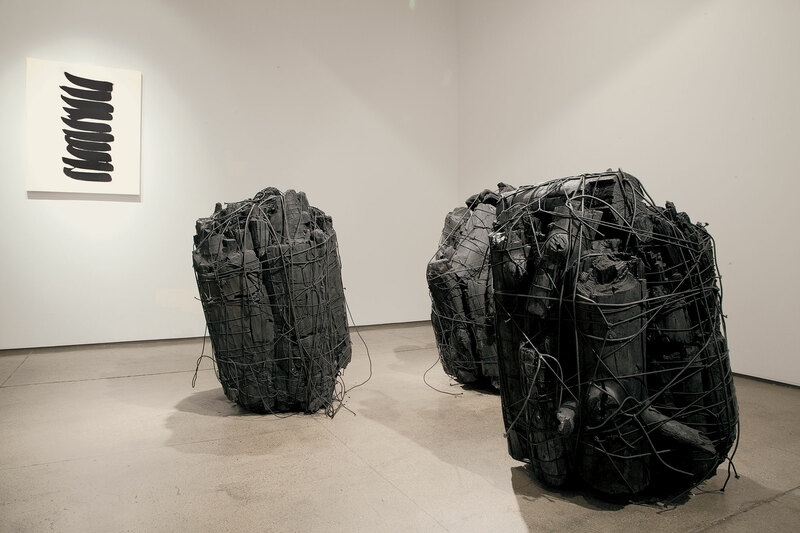 Through constantly reminding us that we are indeed looking at no more and no less than a heap of lumps of charcoal fastened with an elastic band, Lee Bae succeeds in creating an even more powerful physical encounter and confrontation with the viewer. 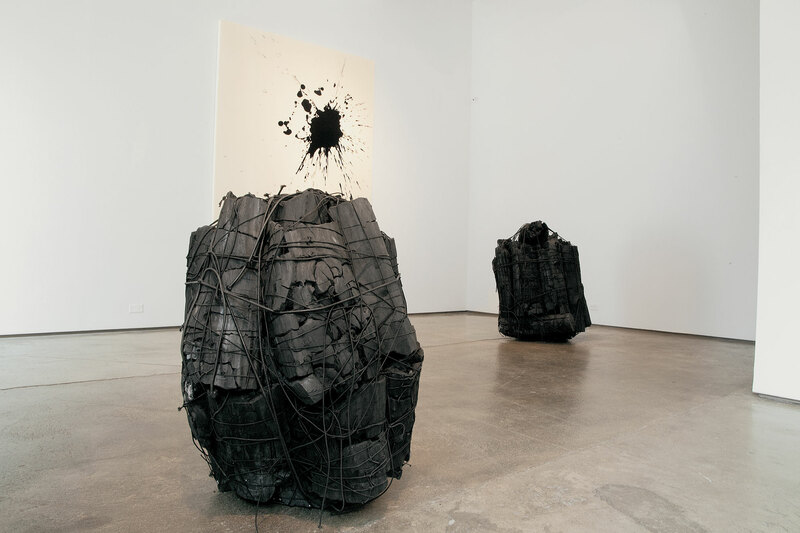 Our awareness of the organic nature of the object within the cultural framework of the space creates an ambiguity that further crystallizes our perception of the spatial/formal relationship between object and locale, art as “choice” and viewership as an act of complicité with the “intent” of the artist. 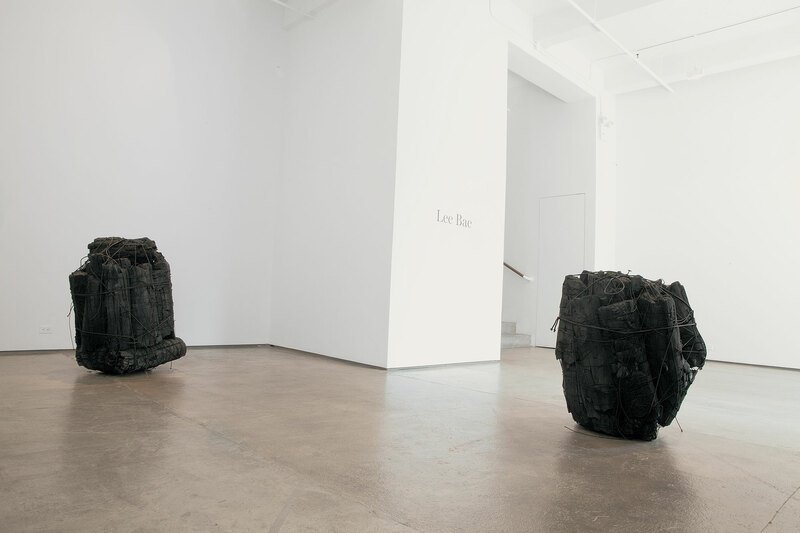 Concomitantly, Lee Bae’s work reflects his ongoing search for a pure expression of form. 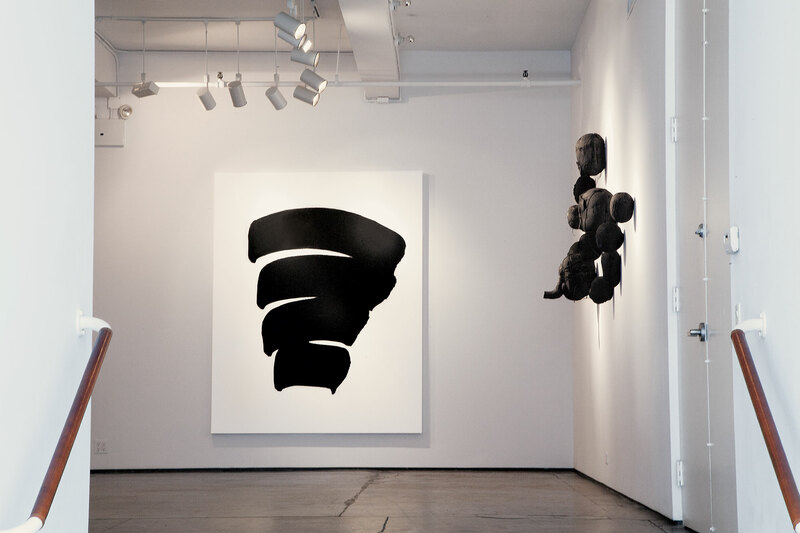 With an ostensible minimalism, he has developed a unique brushstroke almost always executed in black within a monochromatic background of infinite white. The spontaneity of his gesture on canvas, however, is not the result of an “action”, but the final step in a series of irruptive manifestations that Lee Bae executes on paper over and over again until he reaches the form that best describes his mental and emotional stage at the time. 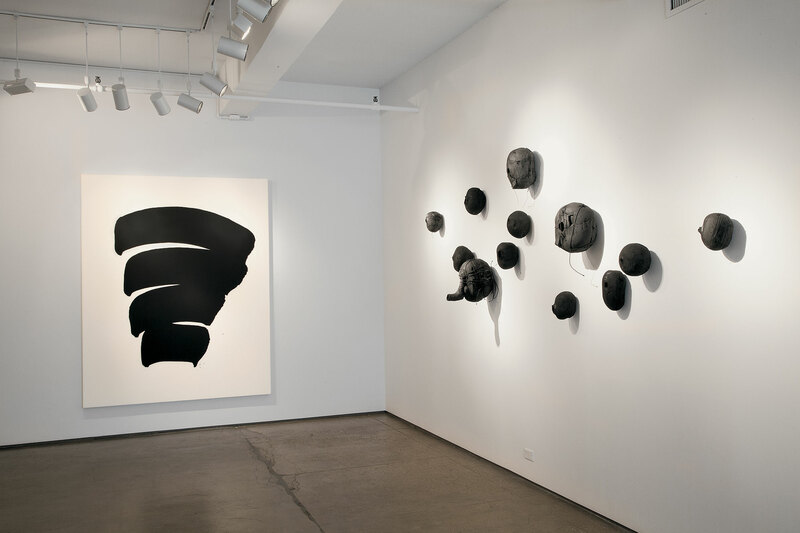 “As such, Lee Bae’s paintings are more than formal excursions into unexplored territory in that they engage philosophical disquisitions on the self, language, cognition, the nature of pictorial representation and the discourse of contemporary art today.”5 In other words, Lee Bae’s paintings act as a repository of attitudes where the visible forms, although never committing to a specific narrative or figural disposition, are always a condensed centre of pure energy that is derived from the artist’s state of being at the time of creation. In doing so, Lee Bae triumphs in bridging the gap between the form as an aesthetic manifestation and conceptual embodiment. French art historian Yves-Alain Bois distills it as such: “Form is always carrying a meaning and the deepest and most important meaning is always at the level of form, not on the level of the referent, or iconological content. (…). (…) The meaning is not the referent. The referent is just the superficial level. It is part of the structure of the meaning, but the least interesting in many ways. The least revealing one.”6 In that respect, Lee Bae is best viewed perhaps as the ultimate structuralist. He neither subscribes to the Platonic definition of Form as a plethora of false representations of the “ideal”, nor does he revert to the argument that forms must remain intelligible albeit non-representational. 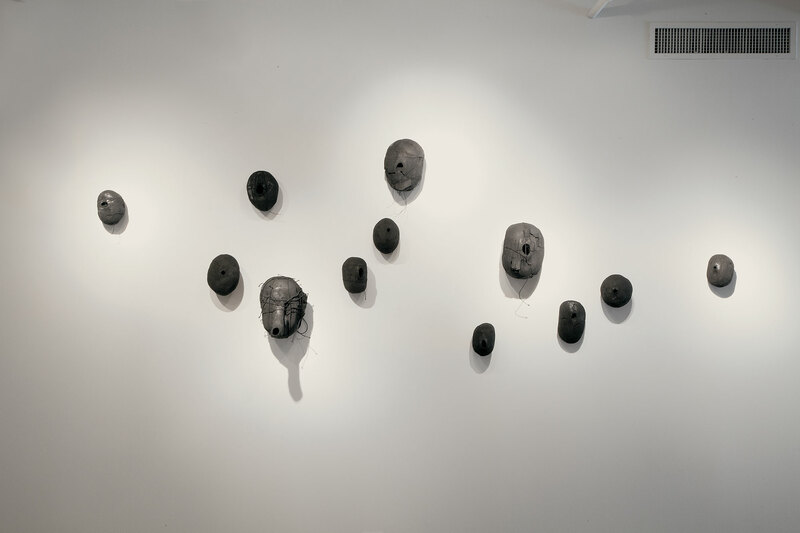 Instead, he draws on the tools of Formalism, as a philosophical discipline, but employs them as syntax within a new structure that equally acknowledges the visual and the conceptual. “I want the forms I paint to be as natural and spontaneous as possible. I leave it open, I don’t want to commit myself to any particular figure that might become restrictive. And when I find the right form, it is truly through it that I can give a body to this black within the white space of the picture. It is very important that the surface of this black body be extremely smooth because that way it takes on the appearance of a skin, the skin of paint as well as human skin. This is what lets me make it most of all a zone of energy, purity and spirituality.” It is our hope that through your encounter with Lee Bae’s work, you will get to experience something of his world where form and concept intertwine spontaneously, constantly playful and infinitely present.